The Breeders of Amy - Stephan & Sylvia Steidl from Ghirali�s Kennel - live approx. 40 minutes drive away from us. - So as Stephan - Chairman of the DRC in our area and a hunter himself - also offers DRC-Courses in Obedience and Fieldwork, it was obvious to get together a A-litter puppy course. Half a year later - with the help from Sylvia - 6 of us started showing our dogs as well. From the very start all dogs produced excellent results in the ring and have received many placements at national and international shows. Today in the Open Class still successful. Through showing we got to make close contact to our litter sire, Ch. Xanthos Gryffindor and his owners Tamara and Peter Ignatieva-Heiremans, who live in Belgium. Tamara is very successful with Amy's father and other dogs of her Kennel: Fine Art Rudgieri. She does not only share with us her great experience and knowledge - her friendship is very precious. Half of our litter group has continued working with their dogs for further education. Some have taken their Junior Hunting Test, others their Obedience Test. 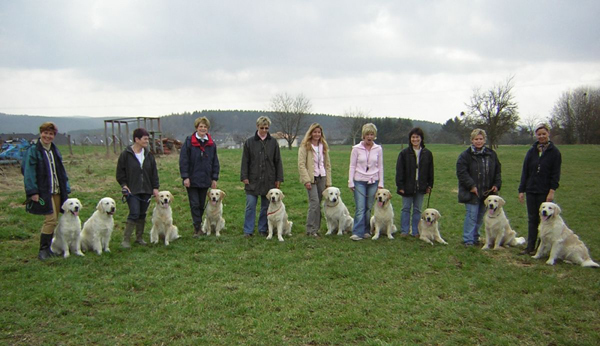 For more than 2 years, 8 out of 10 puppy-families met up for regular Obedience and Dummy training. Through our mutual interest and love to our Golden Retrievers very close relationships developed over the years. No need to say that we all still meet up for reunions, parties, birthdays, trimming and all have a marvellous time together. 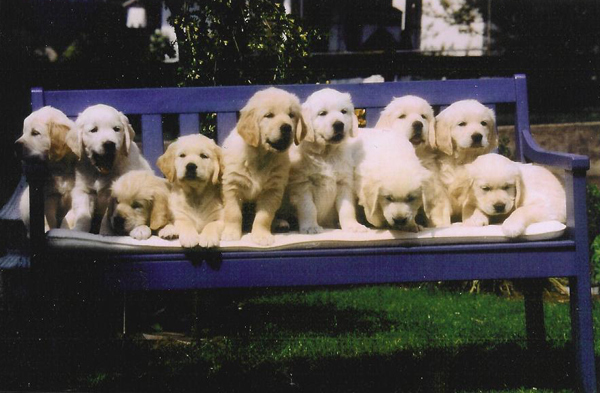 -Sylvia Steidl must have used golden gloves selecting all these wonderful families for her A-litter. A very close litter mate of Amy is Ben, - Ghirali's Aquila. - Martina Rank, the owner of Ben, only lives 10 minutes away from us. - Great to have such a good friend so close.